By Eric Litke on Thursday, January 17th, 2019 at 6:48 p.m.
Wisconsin Gov. Tony Evers was a vocal critic of the state’s economic development agency on the campaign trail, and he’s now in position to do something about it. The Wisconsin Economic Development Corp. is a public-private partnership that oversees grants and loans given to businesses in exchange for the promise of new jobs, including the nearly $4 billion promised to Foxconn for a massive LCD panel factory in Racine County. The agency has been mired in controversy for years amid bad loans, failures to verify created jobs and a critical state audit. Evers has consistently touted plans to eliminate the agency, but several conservative groups have alleged he is backing down from earlier claims that he’ll address that in his first budget. The state Republican party called it a "broken promise," and the MacIver Institute — a conservative think tank based in Madison — said his current and former statements on WEDC stand in "stark contrast." 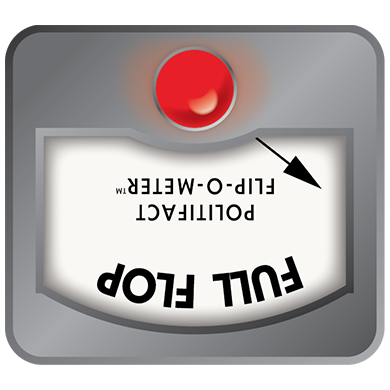 It seemed a good time to pull out our Flip-O-Meter, which we use to gauge whether a candidate has changed his position. Our requisite reminder: We are not rating whether any change is good or bad) politics or policy -- just whether the politician has been consistent. Has Evers been consistent in his pledge to dissolve WEDC? Evers has been a persistent critic of the jobs agency, which former Gov. Scott Walker and Republican legislators created days after Walker took office in 2011. WEDC replaced the state Department of Commerce, and Evers has said he plans to reverse that move — returning economic development to a state agency. The legislation gives lawmakers control of the WEDC board until September 2019 and puts the board in charge of choosing a leader for the agency. The governor used to appoint that leader and will again after September 2019. Assembly Speaker Robin Vos, R-Rochester, has said GOP lawmakers wanted to temporarily take control to try to show Evers it works well and persuade him to keep it as is. Evers’s criticism of WEDC has been consistent throughout the campaign. In an August 2018 interview, for example, he called the agency "a constant source of controversy, inefficiency and ineffectiveness" and said he planned to dissolve it. But his plan to replace it has been a moving target. He floated the idea of re-routing all WEDC funding to local economic development officials and having no state economic development department. But he abandoned that idea a day later. By November 2018 he was consistently referring to plans to replace WEDC with a state agency. Asked if dissolving WEDC remains the plan, Evers spokeswoman Britt Cudaback pointed to Evers’ past statements that he plans to replace it with a state jobs agency. But it remains unclear how and when that will happen. On the campaign trail, Evers was explicit about the timing and method. At a Jan. 28, 2018, East Side Progressives candidate forum in Madison, when asked what priorities he will have in his first budget, including what he will fund and de-fund, Evers said: "We will de-fund WEDC." Now, Evers is saying WEDC will not be addressed in his first biennial budget. "I’m not going to be proposing anything in the budget about WEDC," the governor said in a Jan. 2, 2019, interview with Wisconsin Eye. "We need to get this nine-month thing done," he said referring to the Legislature’s nine-month period of control. When asked if he would include changes in the budget and have them take effect after the nine-month window, Evers said no. "I was never certain that changing WEDC was part and parcel of the budget anyway," he said. "It could have been separate legislation." Evers has consistently criticized WEDC and reiterated plans to get rid of it, but the details of how that will happen have noticeably shifted. In January 2018, candidate Evers said he would de-fund WEDC in his first budget. As governor, Evers now says he will not address WEDC in that budget, claiming he was "never certain" he would address it that way. We rate his position a Full Flop. Published: Thursday, January 17th, 2019 at 6:48 p.m.